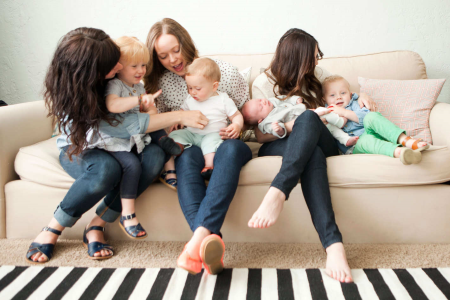 Last week we talked about the importance of building your village, and the many reasons why connecting with other moms — and getting out of your house (yes, even with a newborn!) — is so important. If you’re an introvert like me, this may be just one or two meaningful relationships with other like-minded moms, and a stroll with them — or by yourself — around the block. But what if you don’t have a village? What if you’re one of the first of your friends to have a child – or you just moved to a new place? Or you live in a more rural area where there simply aren’t groups of new moms hanging out at nearby coffee shops, chatting each other up while their babes sleep soundly in their car seats or carriers (ha! Yeah right!)? How, then, are you supposed to meet these elusive people? — The hospital or birthing center where your baby was born – they usually offer nursing support groups that are the perfect places to meet other moms with babies your age. — Yahoo Groups Tip: Start by searching for your neighborhood or town name. — MOMS Club – Scroll to the bottom and click on your state. — Fit4Mom Moms who love working out will enjoy this one. Search for a Fit4Mom group near you, head out with baby in tow, and get a great workout while bonding with baby and meeting new friends. Bonus: it’s super fun! (Marissa, Melissa and Meg did this after giving birth to their first kids, and met tons of other moms … and got back in shape, too). Tip: A jogging stroller comes in handy, here. — Hike it Baby Sticking with the fitness theme, search for a Hike it Baby chapter near you, and sign up for a fun hike for you and your baby (or bring the whole family). The goal? Getting outside and into nature with your little one, while meeting others who also like to do the same. You’ll be amazed how easy it is to start chatting once you hit the trail. — Music Together A global parent-child music class. Music Together feels that music and rhythm are universal languages and being exposed to music from birth enriches early childhood development. These weekly classes are great fun and help you connect with other parents in your neighborhood. — Peanut — Like Tinder for new moms! Swipe up to meet other like-minded moms in your area. Sounds so Millennial and cool. — Mom.Life — This one is sort of like a Facebook group. Anyone (from anywhere) can join to connect with other moms, seek out mom and kid-related advice, etc. See also: Where’s the App to make dad friends? — Facebook Groups — A quick FB search will help you find local mom or parenting groups, or search for very specific types of FB groups tailored to your unique interests/needs (i.e. Stay at Home Moms, Working Moms, Moms who Hate to Cook, Moms with Colicky Babies, Moms with Special Needs Kids, Moms of Multiples, etc.). No luck? Don’t fret. Start your own village! Try making a post on a bulletin board, listserv, or even on Craigslist. So don’t be shy; you’d be surprised how many other women are in the same boat. Go to the cafe, the library, or the park…wherever! Even if you don’t meet anyone, it’s still good for you to get out of the house and get some fresh air. And hey, a little caffeine wouldn’t hurt either.